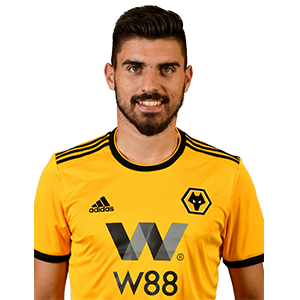 Ruben Neves enjoyed a first season to remember at Molineux, scooping the Player and Players’ Player of the Season awards as the club reached the Premier League. The signing was a statement of intent and Neves didn’t disappoint, hitting six unbelievable goals in his 42 games in the midfield. The final of his six goals was a sensational volley against Derby County, which was enough to win the Goal of the Season award. Neves signed a five-year deal at Molineux and signed a contract extension during the summer of 2018 until 2023. The youngster came through at Porto and made 67 senior appearances for the Primeira Liga side. International honours followed, with Neves making his way up the age groups of Portugal to earn his first full cap in 2015. In the same year Neves became the youngest captain in Champions League history as he led Porto out against Maccabi Tel Aviv. Neves made his English football debut on the opening day against Middlesbrough and netted for the first time away at Hull City. The following season the Portuguese capped his Premier League debut with a stunning free-kick against Everton.